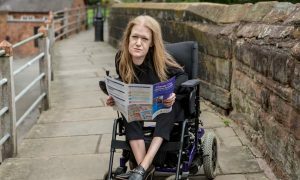 Accessible travel, whether for leisure or business, remains a frustrating mix of impressive common sense approaches with top notch facilities and abysmal attitudes and couldn’t care less lack of access that is discriminatory and short sighted. How about this for a classic example of the above all in just one hotel in Orlando that I haven’t, and won’t now, been to visit ! 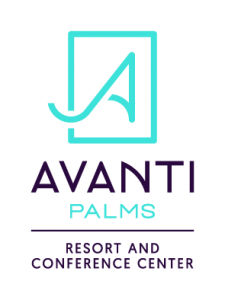 The AVANTI PALMS HOTEL RESORT AND CONFERENCE CENTRE ORLANDO is a mid range hotel that is well located for any with access needs because you can walk or wheel right onto the famous International Drive in Orlando. It’s more affordable than one might expect and on the “impressive” side is a list of good access features that includes, amazingly I thought, not one but two poolside hoists for the superb pool AND Jacuzzi !! Pretty much unheard of that for UK visitors as you rarely see poolside hoists here in mid range hotels, or five star venues for that matter. So, it’s initially an attractive option but then you get to the “attitude” nonsense and it all collapses in a hard to understand mess. Like many needing accessible bedrooms and wetrooms we find that there is a total lack of understanding about what really makes a wetroom, “accessible”. We’ve turned up to find an open room with no fixed or even mobile shower seating. We have arrived to find that there is no proper “drop down railing” in sight or that you can’t transfer from your wheelchair and move it away and close curtains because they are out of reach. Oh and then there’s the poor design that floods your entire wetroom and bedroom for good measure. Finally there’s the real classic. A wetroom which is actually a shower with a step up and again, no railing in sight. So, it matters you see, that the hotel can explain the layout of the wetroom. It can make the difference between a great stay and no stay at all. Heres where attitude impacts. The website has pictures of everything on its site. Except the accessible rooms wetroom. There are shots of empty wine glasses near a pool, palm trees, beds, ceilings, towels, decor, reception desks, cupboards, food, lots of food, and more palm trees. But nothing about something that often makes the difference between being able to travel thousands of miles with confidence that you can actually stay in what is, after all, an “accessible” room ? 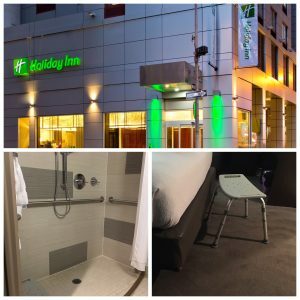 We asked, begged, waited, for the hotel to send us a couple of images of the fixed shower seating or mobilecdhower chair that actually emerged as the only option. Just do we could rest assured that for two weeks I could transfer safely and comfortably. The superb Accessible Travel Forum, see link below, was a wonderful surprise to us and members there worked hard to give us introductions to the hotel to do the simple thing and get us the images we needed. A specialist disability travel agency in the UK (Disabled Holidays.com) tried by emailing the hotel, one they do business with. All of this produced nothing and that includes my seven emails. Two months on and we gave up. Frustrated we’ve cancelled the plans for a four week stay in the USA because surprisingly, given its the entertainment capital of the world, well close to it, the alternatives if you are not driving, are actually hard to source. We knew if we persevered we could come up with something but frankly got angry and tired of seeing how a massive hotel like the AVANTI treats disabled people. We were ready to spend a lot of money there. But nobody cared enough to pop upstairs and for sixty seconds take two images of the wetroom and the mobile shower chair being used there. That’s all we asked. In return, two weeks business. 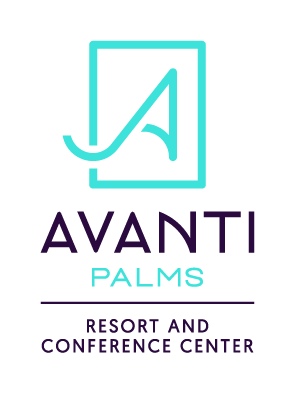 But no, nothing doing at the AVANTI PALMS. If this had been a corporate customer wanting extra room layout images I suspect they would have been sent a whole albums worth of extra pictures. There is no understanding of why it matters to some guests to have this information. It should surely be no trouble to a hotel which boasts about its “accessibility”. The hotel did answer easier questions about external access, the poolhoists and shuttle buses. But it was only ever answers that were close to hand, on their desktop PC’s. Going the extra mile….well, a few feet really, no chance. It’s sad and pathetic and frankly this kind of attitude is as big and disabling as a flight of steps and no lift. So, we are off to Europe instead on a rail adventure to a Paris, Rome and Barcelona and EVERY hotel we have approached is prepared to show us the layout of the bedroom, wetroom and facilities. Nothing has been too much trouble and where we feel we need reassurance we are using John Sage Travel as their expertise, tho frankly expensive, is second to none when it comes to accessible travel in Europe. A sad tale I think. It’s 2018 and here’s a massive USA hotel resort centre with staff who just couldn’t be bothered to take a couple of pictures to help disabled guests ensure they could stay there. There was business almost confirmed. The interest was very serious. But nada. Zilch response when it mattered most. And another accessible trip bites the dust because of a lack of interest, a kind of “this is a nuisance” feel about the place when it comes to disabled visitors. More 1718 than 2018. And here’s that link to the ATF whose members tried to help. It’s a new and great resource for those interested in accessible travel. This entry was posted in The Blue Badge Blog and tagged Accessible tourism, Accessible travel, Accessible travel Forum, Accessible Wetrooms, Avanti Palns Hotel and Resort Centre Orlando, Orlando hotels on 24th September 2018 by rustyman. 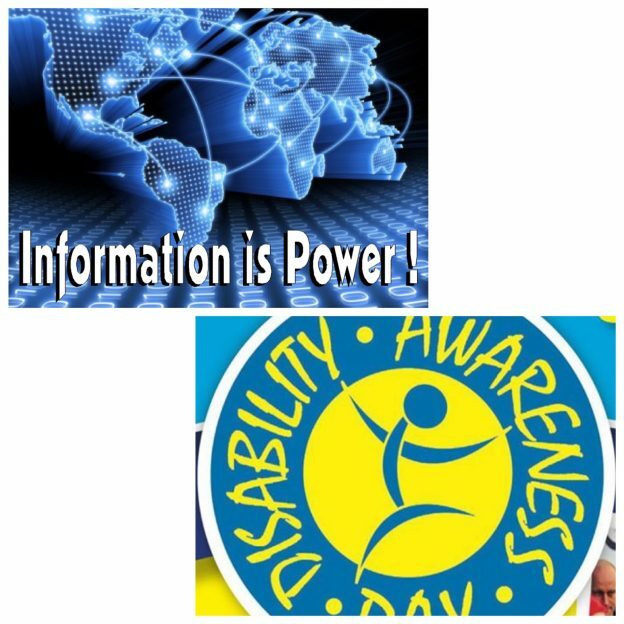 The late and much missed Sir Bert Massie once said that “for disabled people information really is power” and never have those words meant more than they do today. But it isn’t just the simple, yet at the same time incredibly complex fact that information is important that matters right now. It isn’t just that disabled people need accurate, timely and accessible information in order to balance the environmental and very human issues that actually “disable” us. No, it is also about how such information is presented and delivered to not just disabled people but everyone who consumes it. Presentation really is becoming crucially important. The 2018 Disability Awareness Day takes place on 15th July and frankly never has this amazing pan disability celebration of positive news about disability had more relevance. DAD as it is known to the 20,000 plus visitors it has every year for over 27 years, is all about “information” presented positively, in a most accessible way, face to face, with clarity of explanation. DAD is an eye opener, a bit of blue sky thinking, a learning experience in the midst of a lot of fun and entertainment. Few leave without having learnt something new and at times for many this is a game changer. Disabled lives are not all about DLA to PIP, or the impact of BREXIT or political posturing and dark negative news. It is true of course that much of the disgusting impact of the benefit re assessment changes are horribly destructive. The way Motability cars are ripped from their disabled drivers on the often cruel and worse, inaccurate and undeserved, whims of PIP “points scoring” is a modern day disaster and without exaggeration lives are being destroyed. The same applies to the absurd, and impossible to justify, loss of funding for independent living and the crucial and clearly deserved support DLA (now PIP) gives to help some disabled people achieve their potential and play their impressive role in communities, both local and national. But there is a sense that the so called “general public” are becoming disconnected from the reality of “cuts” and have found it hard to summon up the empathy and yes, outrage, that might force a re think by Govt. For me part of this is down to an almost non stop diet of negative news in some parts of the media. There is no real high-reach specialist disability press in this country. We have the Disability News Service which is dedicated to addressing the paucity of disability related news in mainstream media. But frankly it remains a publication dominated by politics and its daily diet of PIP and anti govt dept positions, however “real” and important, feels so repetitive in a world where there is so much else to look at ? DNS gives coverage to some issues that would otherwise never see the light of day. But there’s only so much anyone, even under attack disabled people and their families can take of day after day after day of PIP type stories. I know some will not agree, certainly not the dedicated and utterly determined John Pring who runs DNS !! But I have a similar view about the red tops media in our country. So much of their admittedly woefully limited disability reporting is negative content. Or at least it feels that way. I guess there has to be some of the “Disabled driver loses car lifeline” content else how will the public ever see, well, anything, about the reality of some disabled people lives under this govt. How else will the mess that is Universal Credit policy become real for those not directly involved or the scale of ongoing dire access to public transport be effectively explained to a mass audience ? But where’s the balance ? We are not all disabled Olympians and nor can we all be a Sir Bert Massie, a Stephen Hawking, a Tanni Grey Thompson or the marathon “Wolfman” (what an amazing list that is !!) but hey, actually, whilst unlikely to catch the same attention as our heroes names, everyday reporting of some hugely positive aspects of life for disabled people may just start a trend in re balancing the story of our lives. Which brings me back to DAD on 15th July 2018. Everyone with an interest of any kind in disability needs to visit DAD at least once, but if you go every year you will always find new “information” to support the yes, very ordinary, very “everyday” lives of disabled people and their families. At DAD you will find innovation everywhere you look. Dedication from the exhibitors and of course the amazing DADs Army of staff and volunteers from organisers Warrington Disability Partnership. You will find charities and other hugely dedicated and passionate organisations, commercial and voluntary, that enable living in ways too many to detail. You will find nothing but positive “information” to highlight ways to overcome that still very disabling environment. DAD 2018 will as always be for everyone and trust me, it’s well worth a visit and as Sir Bert said, go grab some information, go grab some power !! This entry was posted in The Blue Badge Blog on 26th June 2018 by rustyman. Why am I a “Young Man” ? I’m very old, at 61 I feel it a bit now, well a lot when the dodgy hip kicks off and the aching shoulder is added to man flu of the Aussie Flu strain. But somehow I recently managed to shake myself up enough to make a trip to York for an all day meeting in what is often described as an glorious historic city. Me? I think it’s ok but historic or not those bloody cracked pavements are a powerchair nightmare. Anyway there I was on the train being very well looked after by a very warm and friendly ‘trolley host’ who throughout the journey insisted on calling me “young man”. This has happened to me a lot since I became a full time wheelchair user seven years ago. 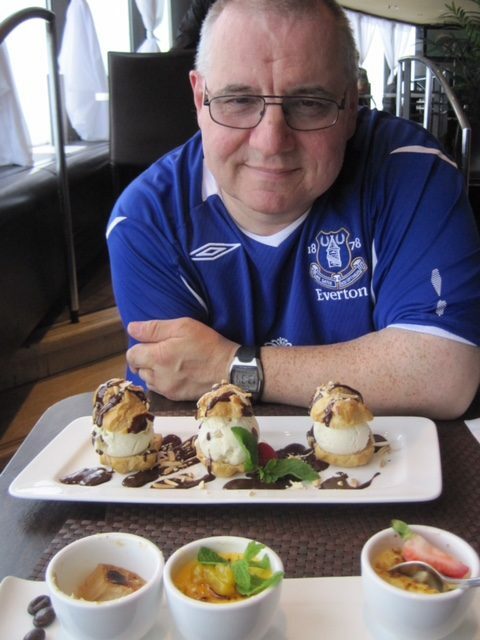 Sometimes it’s accompanied by a gentle or not so gentle pat on my Everton FC baseball cap and even my shoulder. I’m very un-PC and rarely get upset by the Young Man thing. In fact it’s quite a boost as clearly my grey hair isn’t as prominent as I thought it was! I’m a bit less keen on the head patting and shoulder taps but still in my experience there is no harm meant tho, I am respectfully aware that for a variety of reasons some disabled people find the shoulder and head tapping thing very unacceptable. But the Young Man thing is a real mystery to me ? What is it about the wheelchair that makes me appear young ? What’s the background ? I must re read ‘why are you pretending to be normal’ the brilliant book on managing your disability positively, by the equally brilliant Phil Friend OBE and Dave Rees and see if it was covered there. But it really is a strange one. If you can add any light to the shade here please do ! Maybe it goes back to some dark Anglo Saxon rights of passage or slightly more like likely I guess relates to some deep rooted psychology that suggests if your in a wheelchair you are vulnerable therefore young ? This entry was posted in The Blue Badge Blog on 22nd January 2018 by rustyman. Four pictures that in different, but linked ways, highlight the fact that 2018 may be another tough year for disabled people. Pictures can be worth many words but in this case I urge you to click the links below and make the connections between apparently different stories that have huge impact for disabled people in 2018. Esther McVey MP back at DWP but this time as Secretary of State. My guess is that this news will be greeted with huge concern by those whose lives have been or could be massively impacted by the changes that see Disability Living Allowance (DLA) becoming Personal Independence Payment (PIP) via a controversial assessment process. Esther is not exactly a unifying or reassuring force as far as many disabled people are concerned. A few years ago she was criticized for seeming to set out a very clear ‘end game’ for the DLA to PIP process. This despite the obvious observations which added how you can in one breath suggest an independent assessment system is fair and reasonable yet before it has even begun its work decide what the outcome will be in terms of lost benefits / savings ? Next read the heartfelt and powerful story of how one of the most influential leaders in the disability community in the North West sees the ATOS and yes DWP led assessment process. It’s not a comfortable read from Dave Thompson MBE, CEO of Warrington Disability Partnership. His piece on Facebook is an essentially personal reflection of what being caught up in the DLA to PIP assessment process actually means in reality. There is desperation here, anger, dismay, disbelief, and above all a degree of stress and anxiety that is nothing short of cruelty. Few really understand the way this appalling Government policy is destroying many lives. The sound byte world we live in has seen the Government successfully deflect intense criticism of the assessment process because, sadly, ten years of those sound bytes seem to have persuaded middle England that this isn’t about cruelty and inappropriate policy, but it is about benefit scroungers and cheats, also known by some newspapers as disabled people. It’s wrong. Of course it is. Reasonable people reject such nonsense. But read Dave’s piece again and ask yourself how? Really, how can this be in our society in 2018? But then remember that our society currently tut tuts at the news that we have more Foodbanks in the UK than most countries in Europe and farther afield, yet as long as it doesn’t impact the rest of us it can carry on being a sound byte headline along with others on Homelessness, Hate Crime, the destruction of the NHS and the way local community resources and social care have become issues too big to tackle. Next read two links that are seemingly unconnected. Read again about the differing views on how a Supreme Court judgement has changed little for disabled people, mainly wheelchair users, trying to do a very simple thing. In this case use a public bus service to do that most basic of things, get out and about locally and nationally. Unless we better understand the impact of years of legal action that ultimately fails to address the core issues we will fail to see why the lack of legal clarity on who has priority to use a wheelchair space on a bus has massive impact for disabled people and their families. Doug Paulley’s case made headlines and we should be grateful for his efforts to explain why all this matters, but sadly I see no change here and that’s a terrible thing in 2018. 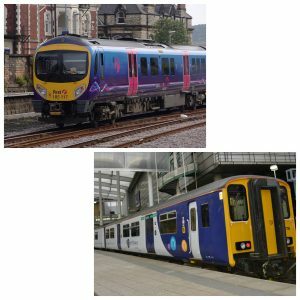 Finally, have a look at the link that reports on more strike action on the railways. This industrial action is not about pay it’s about safety and service. It is about fighting the move to remove train managers / conductors from most trains. For disabled people everywhere it is a hugely significant battle because for many that second person on a train is an absolute lifeline. Taken together the two stories about travel and the two about the DLA to PIP transition seem unconnected. But they are actually one and the same. All four stories are about the same things. Independence, Dignity, Civil Rights, Diversity and Isolation. The sub plot is about work and enabling policies that mean disabled people can play their part in everyday life in their community, pay taxes and NI contributions and be respected alongside everyone else. 2018 hasn’t started well for disabled people. But then it hasn’t started well for the shamefully high number of people living on our streets, waiting for urgent treatment at an A&E, or putting aside dignity and asking for help from a Foodbank. How have we allowed ourselves as a nation to become so cruel, so utterly disconnected from the reality of real life for millions in our ‘prosperous’ country ? 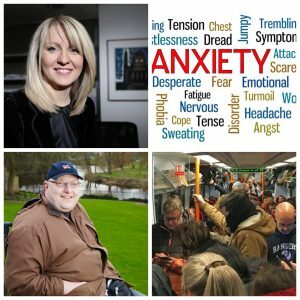 A simple question with I know a complex set of responses, but the real danger is that we fail to see the connection between a range of policy decisions which in isolation are bad enough, but when taken together spell the biggest backward step in the lives of disabled people in the UK for fifty years. All this and I haven’t even mentioned Brexit which is about to impact disabled people in a wholly disproportionate way. Will someone or some Party finally join up the dots and successfully explain that being this cruel, this destructive, this cold and uncaring is not who we are as a country, a society and the communities in which we live ? thrn scroll down this Facebook page to 6/7 Jan posts….. This entry was posted in The Blue Badge Blog on 9th January 2018 by rustyman. 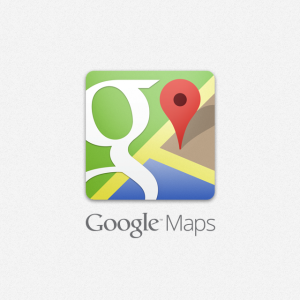 Google getting serious about mapping access is good news in ways you may not expect. When I saw the piece linked too below I had a reaction that will have been similar in many households where there’s at least one person with mobility and access needs based around their disability. So, obviously, anything that helps get accurate information out there about access to buildings has to be good news. But that is even more important when the delivery of that information is the most used, most powerful search engine on earth and generally thought of as one of the leading innovators of our time. Google matters. Probably too much say it’s critics who point to issues around search result rankings and strange looking vehicles wandering down your street mapping everything in right for 3D rendering of ‘down your way’. But when Google Maps sets out to help increase accessibility information, yep that matters. However, I then found myself wondering if this really is a sign that society is at last taking access information seriously ? It’s a long road this one. Hotels are still light years away from where they should be in terms of getting information about accessible facilities onto their websites and in turn those mega indexing and search sites that promise you the chespest room in town. But a handful of hotel chains now feature accessible room in their dropdown box preferences. Public sector buildings are improving the visibility of access signage and online information. Transport providers the same and tho 72 step free tube stations in London remains a small number, the fact that this includes a number of key ‘hubs’ in the city is crucial. Heres the thing. We badly need the likes of Google Maps to lead the way on highlighting accessibility information. It’s influence is huge. Where Google goes others follow. We need more video access guides of tourist venues, hotel accessible rooms, transport hubs and a lot more besides. We need organizations to see and understand that adding accessibility into your Apps delivery is a good thing. If Google Maps can go to the trouble so should you. 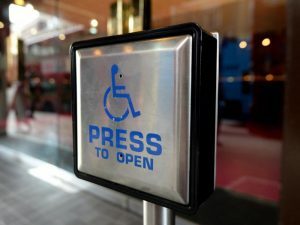 And there you have it, this development at Google Maps will do more than get you instant online information about whether the building you want to get into is accessible and once in, can you go the loo ? Nope, it will shine a light on the whole business of integrating access information into every day life. Not too scruffy that as far as I’m concerned anyway !! This entry was posted in The Blue Badge Blog on 27th September 2017 by rustyman. Chester THE most accessible city in Europe, really, it is !! Yes, Chester is the most accessible city in Europe !! Well I’ve been to Chester lots, and have to be brutally honest, didn’t really expect to see it awarded this accolade but then maybe I was so immersed in just getting around I failed to notice that I was having hardly any problems, you know, getting around !! I will probably wander around a bit more next time after reading the following excellent bit of reporting from the superb DisabledGo.com and will certainly try out some bits of historic Chester which I suspect I stupidly ignored because it is historic and we all know what that can mean for accessibility. But it seems Chester has got it spot on. Find out more about how Chester has managed to become so amazingly accessible via a planned, careful, and visionary bit of evolution. This entry was posted in The Blue Badge Blog and tagged Accessible, Accessible Chester, Accessible tourism, Changing Places, Chester, Chester access, DisabledGo, DisabledGo.com on 22nd September 2017 by rustyman. 1. 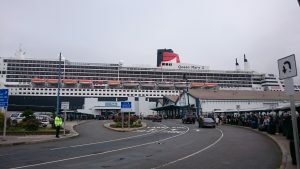 The very accessible Queen Mary 2 remains the only way to cross the Atlantic ! Particularly if your fond of your powerchair or manual wheelchair for that matter, and hate the thought of what airport baggage handlers might do to your crucial bit of kit. It’s not budget of course. Far from it. But for a special “Big Hol” a surprisingly roomy accessible deck five ‘Inside Cabin’ can be yours for £1100pp and yes that’s a lot for us mere mortals but heck it includes seven days and nights of very good food, lots of it for 20 hours a day, and a variety of really decent entertainment. All on huge beautifully appointed floating fully wheelchair accessible five star hotel. Sorted. 2. Washington DC is a fabulous city but eating out there is eye wateringly expensive. 3. Visit Washington in late April ish, avoid the hordes or is herds, of American school kids in their matching T shirts and baseball caps on end of term trips, and at the same time enjoy cooler weather, way fewer lines at your fave Smithsonian Museum (there’s only 40 to choose from and they are all brilliant) oh and eat at The Pig restaurant just off Rhode Island Avenue and share meat cooked as it should be friendly locals. 4. Washrooms in the States, or toilets to us Brits, are often aweful. I have no idea how the usually quite demanding customer service fans that live across the pond endure their public Washrooms. My experience wasn’t good. Integration has arrived in the Washroom world. This means the wider-door accessible loo is found within the main loo block alongside the “normal” loos. Result : because there is no official accessible loo designation in these shared places anyone uses the accessible loo. So you are often, and I mean often, left waiting, and waiting. It just doesn’t work, give me a clean separate Radar key accessible loo any day and integration can take a back seat for once. Oh and many of these USA public washrooms are very smelly and messy and sometimes you come across people living in them which is horribly sad. 5. Use Washrooms in Smithsonian museums and posh hotels and restaurants whenever you can. See above ! 6. Boston is so cool and laid back it’s spooky. You need a week at least to do it properly and it’s compact, with decent access especially the impressive Metro T where nearly all stations and yes all trains are accessible. 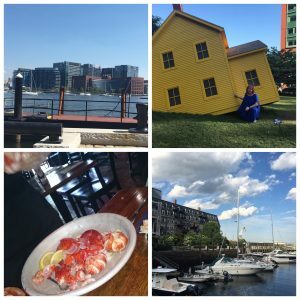 Don’t leave Boston without having had Maine Lobster at Tia’s restaurant on Boston Harbour, or do a student guided tour of Harvard or spend a day on Boston Common and in the city centre. 7. Parts of New York City are getting a bit grubby, particularly the south Manhatten Canal Street areas. But do not miss the new 9-11 memorial which is simply stunning, respectful, emotive and inspirational, all at the same time, as indeed it should be. And hey this is still a superb city to spend time in. 8. Central Park remains the jewel in the Big Apple’s crown. What a joy it is to wander it’s paths on a hot sunny day. But outside the park watch for those dire uneven pavements and roads where there are more pot holes than bits of flat road. 9. Do visit and stay in Brooklyn. Eat at Juniors on Flatbush Avenue, enjoy the company of people in a proper neighbourhood and take in the fabulous views of Manhatten from Brooklyn Harbourside. !0. Do stay at the DoubleTree hotel in Boston, lovely accessible place that it is, with a great wetroom shower ! How sad am I !! 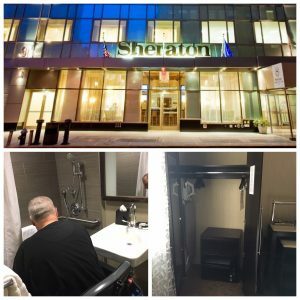 Do not treat yourself to a stay at the Sheraton Hotel Brooklyn, it’s not any where near as accessible as it says and it’s hugely over-priced and nothing like the luxury brand you may expect. Do try the Mason and Rook Hotel in Washington and enjoy its leafy avenue location, it’s large accessible bedrooms. 11. Use Amtrak which is surprisingly accessible, the Red Caps are indispensable and the Acela Express to Washington and Boston from NYC is just great. 12. Whilst in the three cities consider the hop on hop off type tours. 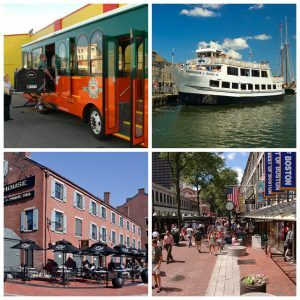 Not all are accessible but the Old Town Trolley buses in Washington and Boston have half their fleet with sturdy if temperamental wheelchair lifts and a 90 minute tour is a great way to decide which bits of the city you want to take in next. 13. Uber WAV or Uber Access taxis have arrived in many USA cities and that includes the three discussed here. 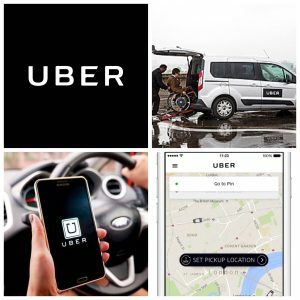 Whatever your views about Uber it remains the case that unlike many cab companies they are now providing rear ramp accessed cabs, booked safely from a mobile phone App with payment made via PayPal and tho it can be a bit hit and miss in terms of getting one quickly i.e. within 15 mins, mostly it works well. 14. The mandatory outside-the-Whitehouse picture isn’t what it used to be. New Security barriers take you further back from the famous railings and frankly it’s a bit meh but you can get to bore your friends with tales of how you plonked yourself right on the spot where CJ Craig and Josh discussed President Bartlett in the West Wing, which is brilliant television and I’m sure far more Presidential than what goes on in the place right now ! 15. And finally, eat ice cream from the shack under the Brooklyn Bridge ! We did and found ourselves sitting next to Evertonians, how good is that ! This entry was posted in The Blue Badge Blog on 23rd July 2017 by rustyman. Boston really is a cool city, even when it’s very hot ! The Amtrak Acela Express winds its way from NYC’s Penn Station to Boston South station via some lovely sea front scenery and in only just over 3.30hrs your arriving in this laid back and rather special city. The Acela Express is really accessible. It’s a low ramp or ‘bridge plate’ between platform and coach or carriage as us Brits call it. The wheelchair space is not quite as large as that on a Virgin Trains Pendolino but it’s ok and my Salsa R1 (no foot plates) fitted fine. 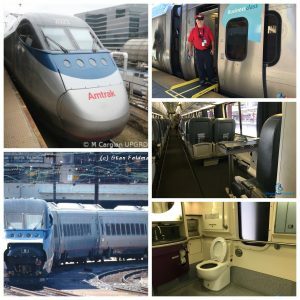 The large accessible toilet is surprisingly easy to use, tho as the Acela gets up speed I’d advise against too much of the ‘transferring onto the loo ‘ activity ! 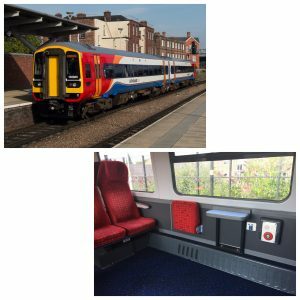 But really, this is a very accessible train, albeit an expensive one as all seats are either in a business class standard coach or a First Class coach. DoubleTree by Hilton, Boston South Backbay area. Next to a large hospital and helpfully a fully accessible Metro T station, this was from a number of viewpoints the best holes on our USA trip, certainly the most accessible. Large bedroom with two huge beds, room to manoeuvre, air conditioning, a safe, a fridge, a large TV. And, a cracking wet room bathroom with very large, deep, well designed shower seat, decent railed areas around shower and loo. All parts of the hotel accessible. Best vfm. Location good once you leave the rather depressing and grubby Chinatown area. 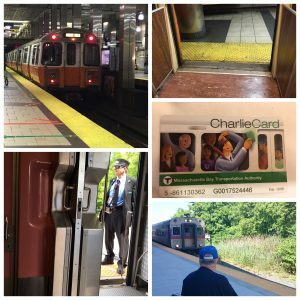 Close to city centre, Boston Common, the harbour, a number of Metro T stations and links to the North Station and overland services. Mid range cost. The Boston DoubleTree by Hilton hotel, superb access. What did we see and do ? Five days isn’t really enough to see all that Boston has to offer but it does give you a sense of the place, its vibe, it’s laid back view of life and just how gorgeous this part of the USA is to live in and enjoy. We loved the accessible Old Town trolley bus tour which we’d seen and used before in Washington. About one in two buses have the sturdy if temperamental wide wheelchair side or rear lift. The drivers commentary is always interesting, informative and sometimes very funny ! It’s an expensive 90 mins but worth every cent. The ‘free’ additional 45m tour of Boston Harbour not so much. It wasn’t even 45 mins, the commentary is tired and the wheelchair access very tough and I can say this having nearly tipped my 110kg plus moi powerchair right over backwards trying to board on a strange humpback ramp ! I didn’t end up in the harbour thanks to a couple of burly sailors but it wasn’t fun. Try the Chart House restaurant on the harbour. The prime rib and seafood is superb. The building is the second oldest in the city and you are treated to a scroll with the Declaration of Independence and the constitution so you understand a little about the Tea Party history ! Pricey but well worth the treat. We wandered into the Fannueil and Quincy Market areas which look very good in the sunshine and are a bit more accessible than Covent Gardens’ cobbles ! Take the accessible Boston Old Town Trolley Bus, give the ship a miss!! 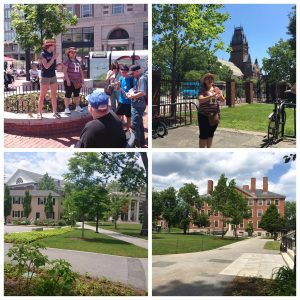 Whatever you do don’t miss the chance to see Harvard and take the amazingly cheap $24 for two people guided tour ! Our guide was ‘Liz’ a fourth year student taking Molecular Biology ! It’s 60 minutes of insight, corny jokes, Q&A and as Liz put it, beautiful buildings mixed with ugly horrors from the 60’s. The Russell House Tavern does a very decent lunch in its air conditioned accessible basement with a small number of gluten free options and at a reasonable cost. Salem in 94f heat ! We got the overland train to this place of witches and gallows and aweful pavements ! It was fun and some lovely walks and harbourside eats. But try to do it when it’s cooler as there’s not a lot of shade in this place except the graveyards which were not that accessible and a bit spooky ! 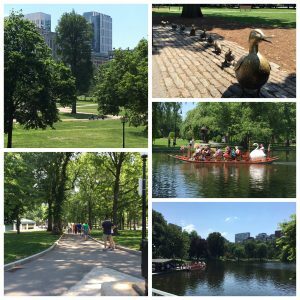 Boston Common in the sunshine is gorgeous and you can easily spend a day in the area, and arrive back at the hotel totally shattered. See the bronze ducks and the quaint lake boats paddled cycle style by very fit people ! The Boston gardens are lovely, the massive Bunker Hill back into the city centre not so much ! The Boston Public Market near the Common is the best in the city. We wound up back at the harbour, at a restaurant called “Tia’s” alongside the ship shaped Marriott Hotel. Wow. It’s sensational. We had the lobster of course, with background commentary by our brilliant server who, exceptionally due to the one handed nightmare in prospect otherwise, expertly extracted all the meat from my two x 1lb Maine Lobsters ! Gluten free options there were, and my wife’s lobster roll was delicious. All for less than $65 which trust me really is a bargain ! On the way back to the Doubletree there was even a chance for a picture at Dorothy’s house from the Wizard of Oz, my wife’s fave film and after ten miles in 94f that air conditioning was very welcome ! Don’t miss a guided tour of Harvard ! Oh that Maine Lobster ! What’s it like to get around ? Quite easy actually. It’s a relatively compact city for walking, tho there are some wicked hills ! Buses are accessible and cheap. The Metro or the T as it’s known is nearly all accessible but watch out for the odd station with higher than usual ‘gap’ between platform and train. The trolley bus tour really does give you a great plan as to where to walk to and when. The overland train services from North and the larger South stations are good and the Red Caps friendly, tho the expected $3-$5 ‘tip’ per bag adds up during the weeks away ! However, as in Washington and NYC don’t begrudge the Red Caps this tip or fee as we called it, it’s a great service for anyone less mobile and you actually get to,the right platform at the right time. So that’s Boston. A brilliant city. Lovely people. Very accessible and the food, well did I mention the lobster and the prime rib ! 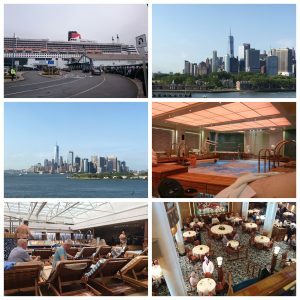 Queen Mary 2 to the USA part 3 : It’s New York City, Manhatten and Brooklyn !! New York City, shiny, bold and always busy ! We have been to New York City a few times and love it. 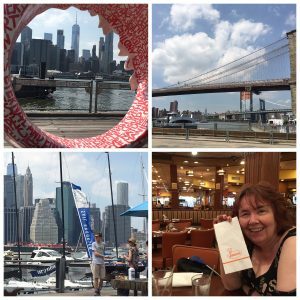 This trip, part of two weeks that saw us in Washington and Boston for the first time, was all about lower Manhatten, the new 9-11 memorial, a gorgeous hot sunny day in Central Park and several days spent discovering Brooklyn ! The Holiday Inn Financial District and the Sheraton Brooklyn. Both hotels were costly disappointments, particularly the aweful Sheraton. The Holiday Inn was cramped, a poorly equipped wet room, no room to manoeuvre the wheelchair between two large and I have to say comfy beds, with a wardrobe too small to take many clothes and building site for a location…..tho once away from the immediate hotel area you are literally right on top of the superb Freedom Tower, the 9-11 memorial and Westfields amazing whole-food shopping centre alongside the breathtaking new and fully accessible transport hub. The Sheraton Brooklyn is just such bad value it’s not true. It cost a staggering £700 for two nights. Was meant as a bit of luxury at the end of a very special holiday. The “accessible” bedroom is poor. The wet room dire. It’s way too small and there’s no room to turn a powerchair properly, no fixed shower seat or mobile shower chair. To use the loo some will have to leave the door open into the bedroom and there is no side transfer onto the loo. I had to use two child mattresses and a square Ottoman as ‘steps’ to crawl onto the floor to get into the shower, it was that poor. The staff were then decent enough to admit that the room shouldn’t be booked by disabled people unless they can walk from their wheelchair !! Ok it was an expensive mistake but don’t be kidded by this example of a supposed upscale brand, there are a lot of better more genuinely accessible hotels in the Big Apple. The Holiday Inn Financial District, location good, poor vfm. The new 9-11 memorial is just stunning. It’s all accessible. It’s moving, inspiring, wonderfully well designed and a credit to the city. A dignified and respectful way to honor those murdered on that terrible day. 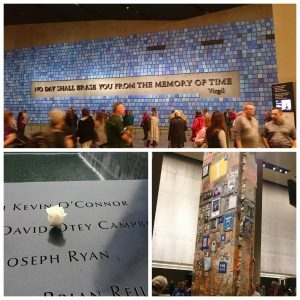 Pay $24 each for 60 minute tour, it’s amazing value, the insights alone add hugely to your understanding of what happened to the Twin Towers and how this great city stepped up and proudly fought back. The two memorial ‘pools’ outside are also very moving, Touch a name etched around the steel sides of the pools and keep those memories alive. Freedom Tower itself is impressive, the ride up the super fast lift a bit different ! The views amazing and the lunch at the top of the world, affordable and tasty. It’s all accessible. We spent a fabulous day in Central Park. The gorgeous weather helped but this is a fascinating space and it’s easy to see why New Yorkers jealously protect its borders. 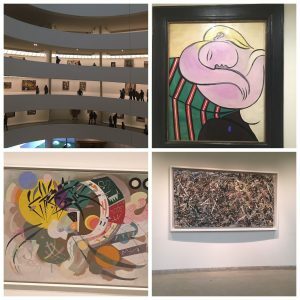 We decided to do something a little different and did a long walk to 86th Street and the thought provoking Guggenheim museum of modern art. It’s surprisingly pricey to get in, about $50 for two. The circular ramped style design of the exhibits is unusual and accessible tho quite a push for any wheelchair user without an engine under their bum ! The art is, well, it’s all in the eye of the beholder as they say and I made it up to the very top floor to look quizzically at the famous Jackson Pollack……don’t ask me to critique it ! The Guggenheim Museum of Modern Art, give it a chance ! How did we get around ? In truth, we walked, a lot. Easy for me in the powerchair tho in some areas the lack of dropped kerbs and terrible state of the sidewalks made life tough, particularly the Canal Street area. 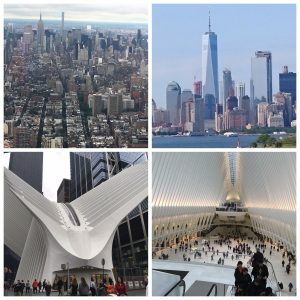 We did try the stunning new transport hub at the World Trade Centre and experienced a NYC Subway train for the first time – it was an adventure, just about wheelchair friendly, but few stations can be used and frankly it remains a risky if lively way to get around the city. The buses are all accessible which is useful. 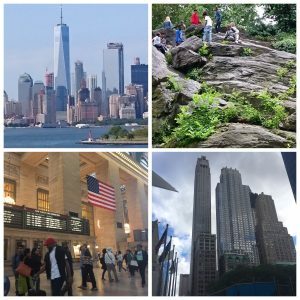 But walking and navigating your way around the famous NYC grid system is interesting, not too difficult and you quickly find yourself caught up in the frenetic lifestyle ! We did use the new Uber wheelchair accessible cabs via their App. It was hit and miss. Not overly expensive and mostly reliable but some long waits. The rear access ramps were great, the drivers knew their stuff and honestly we’d use Uber again whilst trying to forget about the many criticisms of them as a company, which is hypocritical but frankly this accessible service can be a life saver. Very different ! Felt like a real neighbourhood. Lots of side pavements and narrow ones towards the river. Local shops and local people, it had something about it that was really not Manhatten. I bravely had my hair cut in a Latino barbers, big cutthroat razers, loud chatter, and a very good no3 !! Everywhere we went we got a friendly welcome. Juniors restaurant off Flatbush Avenue served up huge tasty meals at reasonable prices. The pancakes for breakfast was a Slimming Workd disaster, piled high and oh that Maple Syrup ! The walk down the harbour side is well worth the effort, we came across a film crew putting together some scenes from Sesame Street! The view of Manhatten is just sensational from Brooklyn. Overall even just a couple of days allowed us to feel comfortable in this cosmopolitan place and we jealously looked on as casual diners cooked their steaks in a family BBQ area with quite simply a view to kill for ! Dont stay at the hotels we did ! Visit the new 9-11 memorial museum and do wander around Central Park. Give the subway a miss until more stations are made step-free. Try Brooklyn, it’s really worth the visit and it’s people are friendly ! Stay midtown and walk the city in blocks, not too many each day, the planning pays off. Wheelchair users watch out for aweful sidewalks and in some places disappearing drop kerbs. Cheers, Rustyman, and don’t hesitate to email me on efcmark777@yahoo.co.uk if you’d like any other feedback on our trip to the States. This entry was posted in The Blue Badge Blog on 20th July 2017 by rustyman. 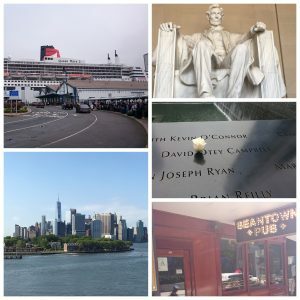 Queen Mary 2 to the USA, Part 2 : ‘Washington DC, what a classy and accessible city’ ! Washington DC, what a classy & accessible city ! Washington DC, it really is a classy city and incredibly accessible. It’s dynamic, hugely expensive, very busy, but full of lush parkland, amazing buildings and has the National Mall and the 40 or so museums that together make up the “Smithsonian”. Truth is Washington surprised and delighted us in equal measure. By Amtraks “Acela Express” from Penn Station in midtown New York City. Amtrak’s trains, particularly this express variant, are very accessible, with low easy board ramps or ‘bridge plates’ and a wheelchair space in every non restaurant carriage or ‘car’ as they are often called. The accessible loo is huge by UK rail standards. The doors tho are manually operated and sometimes very tough for a power chair user with one arm ! But my salsa R1 had loads of room to manoeuvre and the rails etc were helpful. Here’s a tip tho….don’t go for a wee or more when the train is at top speed and rattling over tracks like a roller coaster. It can be scary and a little unstable ! Amtrak was great throughout our trip, the Red Cap service was a must, even with the high cost of tipping at around $3-$5 a bag. The Acela Express is a business and first class only train and it’s a bit pricey to be honest at around $150 for a single between Washington and NYC but these prices vary and there may be bargains to be had at low season rates. Mason & Rook on the gorgeous Rhode Island Avenue. 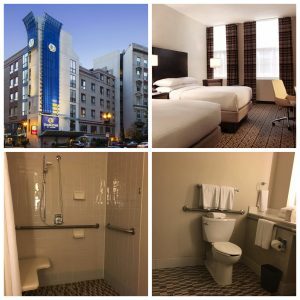 About a 15 minute walk from the fully accessible DuPont Circle Metro station. A lovely and slightly boutique type of hotel. The accessible room was big, really comfortable, and had a large wet room bathroom with limited rails around the shower and loo areas and no fixed shower seating. The bed was massive and very high. The air con worked well ! Access was good around the hotel and the staff, especially Reggie the brilliant concierge, very welcoming. Watch out for the slightly sly addition of a “hotel fee” at the end of your stay, $20 a day meant to cover the ‘free’ coffee and glass of wine pre dinner period each night. But we loved this hotel, the staff were great and the location really good amongst the tree lined avenues. Local restaurants were not that plentiful to be honest but “The Pig” was sensational tho you really have to love pork ! It was good for gluten free options and again the servers here were amazingly friendly and knowledgble about the menu. 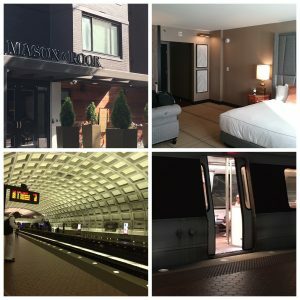 Mason & Rook is not a budget hotel. But it’s priced at a level comparable to somewhere like a Staybridge Suites, or Hampton by Hilton. We had five full days, needed two weeks, at least ! We used Day 1 on a brilliant 90 minute trolley bus tour. Wheelchair accessible via a lift system that could be temperamental and was only on every other….ish….trolley. But the driver commentary was superb and it’s a great way to get your bearings albeit at around $35 each. We spent the afternoon in a surprising way, exploring the incredible “US Postal Service” museum, part of the Smithsonian and right next to the exciting and accessible Union Station. Now, don’t laugh. But this postal museum is an absolute best kept secret kind of thing. The building is stunning. It’s all accessible. The museum is fascinating with a series of displays that honestly are really interesting and different. 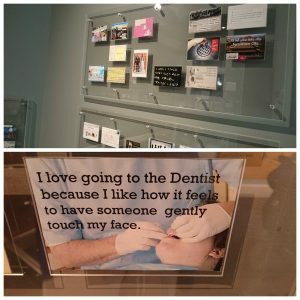 But right up there in the ‘wow’ category is the exhibit called “Post a secret” which is where people from all over America, indeed the world, have written secrets about their life on a postcard and sent it to an address in the States. It’s quite dark to be honest, there are heart breaking messages of despair that shake you. Then uplifting messages that shine a light on family life in a positive way and often highlight courage in the face of adversity. Honestly, you will spend an hour just here, slowly reading the exhibits cards picked from over a million sent…..and drag yourself away, moved, a bit disturbed, but caught up in the moment and buoyed up, all at the same time ! Oh and the toilets or restrooms are lovely, and didn’t prepare me at all for the horrors of restroom hell which I encountered throughout our trip – see the end of this missive ! Macon & Rook, a lovely hotel close to the very accessible Metro. Post a secret postcard, truly a memorable exhibition. The highlight of our trip to Washington was a visit to the Supreme Court. The building is magnificent. It’s all accessible. We got lucky and arrived when the court wasn’t sitting so we’re able to attend the free lecture in the court room itself. Given by a Court Intern, the lecture lasts around 40 mins and takes you thru this cherished part of the American legal system and Constitution. You get the chance to mark questions and you learn a lot in a short time. Fascinating and thought provoking. The Court is full of large format pictures of the men and women who shaped justice in the USA for hundreds of years. There is an interesting video presentation to watch and a number of exhibits that add detail to the story of how the court ended up in its magnificent home. The cafe is a delight by the way and yes the loo’s are lovely ! We visited the Air and Space museum which many had recommended but frankly found it a bit underwhelming and overcrowded in early June by literally thousands of USA school kids on end of term tours. The McDonalds on site is the only eatery and it is one of the largest in the world ! The IMAX presentations are interesting but don’t quite have the wow factor. The Holocaust Museum is as you would expect, both daunting and provocative and of course very moving. Set in a simple red brick and concrete five stores building it takes a long time to view. 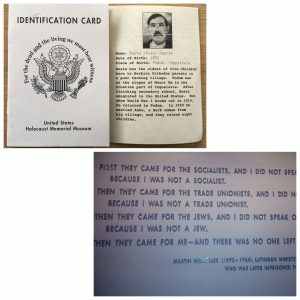 You can take an ID Card on entry and it’s not till you get in the main museum area that you fully realize your carrying a card that describes the life, and death, of someone murdered by the Nazis during WW2. The museum is stunning in different ways and you really need to visit it to,understand why. It’s fully accessible. We also visited the Capitol, enjoyed seeing the Senate floor from a loft viewing position and the architecture here is wonderful. The long marbled floor tunnel to the Library of Congress is I guess worth the walk. The library has some riveting exhibits but frankly when you allow hundreds and hundreds of school kids in all at once you do adversely impact everyone else’s experience. Go off season if you want to really see the Library properly. We spent half a day at Arlington Cemetery and it was worth the time. ID that makes you think and a message for all to read. 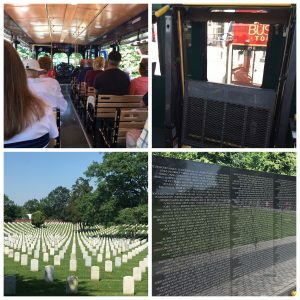 The trolley bus really is accessible, and the Arlington Cemetery extension is a great way to see this special place. The National Mall needs little introduction. It’s a jewel in Washington’s crown, amidst a few stunning jewels to be honest. We saw Mr Lincoln and yes you can get up the monument in a slightly shaky lift to within touching distance of the great man. We Touched the impressive Vietnam memorial wall. Wandered thru stunning parkland on our way up the mall and then somehow my wife managed seventeen more blocks to the White House in 92f ! I of course navigated all this in my power chair with ease ! The White House photo op was done but frankly it’s all a bit sterile, thanks mainly to the understandable but obtrusive security measures. But I did get to see where CJ Craig and Josh from my fave tv show ever, the West Wing, appeared out of the Oval Office and onto Pennsylvania Avenue ! What was the food like ? Well, it’s the most expensive city to eat in we’ve ever been too. Surprisingly the centre of the city is not over blessed with restaurants. We had a gorgeous meal at ‘701’ right on Pennsylvania Avenue and broke records for the most expensive, but amazing, steak meal at ‘Ruth Chris’ on 9th Avenue, both fully accessible. But the ‘Pig’ restaurant near the hotel really was rather good too. How was Getting around the city ? The answer is “surprisingly easy”. Firstly the Metro is fully accessible and less busy than most except for the really peak times of 1700-1830 and the morning rush hour which seemed to be 0730-0900. My salsa R1 powerchair coped well with gap between the platform and the Metro trains, most of which were new, with live digital route signs onboard and station announcements. There is plenty of space and a blue badge style spot marked out on the floor for wheelchair users. It really was a joy to use. Buses are all accessible too tho we didn’t try this. Oh and the new UBER WAV (rear wheelchair ramped) taxi service worked well for us on the few times we used it. Note you need the Uber App and that means switching on roaming on your mobile and, it’s expensive ! Unlike the Uber fare which was very reasonable. 1. Go in April, its cooler and the cherry blossoms are out (check first !) and there are a lot fewer school tours ! 2. Staying just outside the centre works well providing your near an accessible Metro station. 3. 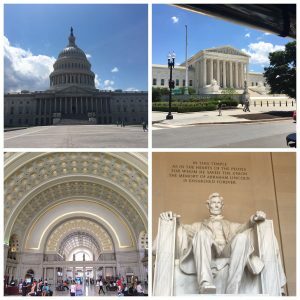 Visit the Supreme Court and the Postal Museum, you won’t be disappointed. 4. Eating out is very, very, expensive. Eat dinner away from the centre. 5. USA Restrooms are not great, integrated wider door wheelchair loos are not designated just for those who can’t use the narrower loos, which means you often end up waiting, and waiting, for the ‘big loo’ to become available. I found the male restrooms in many public places to be really messy, crowded, not always clean and often home to some without a home which was sad but on occasions a bit intimidating. Very surprising this, but in truth I can’t believe how aweful some of the restroom experiences were and recommend trying to time your ‘need to go now’ moment to when your in a posh Smithsonian with a better class of restroom !! Next up will be reviews of our visits to New York City (Manhatten and Brooklyn) and Boston. This entry was posted in The Blue Badge Blog on 12th July 2017 by rustyman. It’s a crossing NOT a cruise ! Well trust me, whatever the most devoted Cunard customers want to call it, a journey to New York City and the East of the USA onboard the Queen Mary 2 really is the only way to cross the Atlantic ! The only way to cross the Atlantic with your powerchair ! My wife and I travelled to the land of Donald Trump (how the heck did that happen America ?) 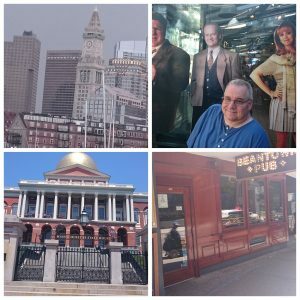 in late May 2017 and then did the return journey a couple of weeks later (see my accessible stories from Washington, New York & Boston in future blogs) and here’s how a Salsa Powerchair and excited user navigated the trip. So, how accessible is the Queen Mary 2 ? The answer is, “very”. From a wheelchair users perspective the ship is an accessible dream. Embarkation at Southampton’s impressive Ocean Terminal is smooth tho the ramps that take you into the ship can be a little steep and there are a couple of “high ridge steel joins” that need a bit of careful negotiation, but it’s ok and here’s a tip for any with mobility impairments registered as such with Cunard. Arrive 90 mins ahead of the official boarding time and you may get on board earlier than your designated time and always accept Cunard offer of someone to help you board. The accessible cabins or “Stateroom” as Cunard call it rather poshly are very decent. This trip we decided that a window or balcony cabin was a waste of money when for the most part what you see, is, well, sea ! 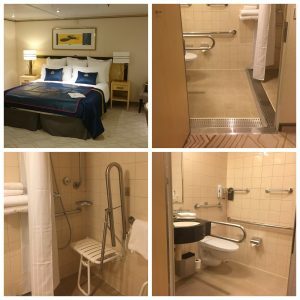 We booked accessible Stateroom 5130 mid ships on deck 5 and were very impressed with the space. The images below show you an obviously tight ish wet room bathroom but I could manage in a salsa rear wheel powerchair which has no foot plates. Having said that the fixed shower seat is not very ‘deep’ but the rail system is good and you have just enough turning space. The bed is a high one but very large. No overhead hoist type system I’m afraid. The limited number of accessible cabins are pretty good. Around this magnificent classic Liner wheelchair access, and that for anyone with a mobility impairment, is good. But this is a huge ship and in a manual wheelchair getting from one end of the QM2 to the other is a big push. This time in the powerchair it was very easy and we both appreciated the engine under my bum ! All restaurants are accessible of course and crucially the lifts are relatively plentiful and mostly you can get on a lift with only short wait times. The spa is lovely and spookily there is a superb hoist into the gorgeous therapy pool which is warm, full of jets and bubble making kit, and frankly a bit fierce ! Sunbed type loungers can be accessible but they are popular! The steam rooms and showers don’t work for most wheelchair users but the changing rooms have an accessible shower and loo. Not bad in an area we expected to be inaccessible. You can get a six day pass to the Spa pool and shower areas etc for a vfm $104 pp but beware, the long list of well respected therapy treatments are honestly just for the rich, some very short treatments can set you back $600 but a superb shoulder and back PHYSIO massage and laser treatment costs you $240 delivered by a capable guy called “Dragan” but frankly even tho it worked wonders for my dodgey shoulder it was truly a one off ! The rest of the pools have mixed access with one, under the glass dome, having a hoist system, but it’s so small it’s hardly worth the bother. The wonderful theatre is wheelchair accessible but places are limited and you get used to rocking up 25 mins before the performance starts to secure the accessible seating areas. The View of the stage is great. Entertainment on both our crossings was hugely impressive. Food in the Britannia Restaurant was, to be honest, good but not outstanding. Very small portions at times are a surprise but there are standout meals like the lobster, chateaubriand, lamb and some decent veg and gluten free alternatives but again, choice in those areas wasn’t as good as we’ve seen before. The food in the refurbished Kings Court buffet is amazingly good and the speciality nights they run there, for an extra $17.50pp, are superb. Try the “bamboo” night, it’s very different !! Sadly the ship has become a bit of an “upselling” zone. There are a lot of extras you can pay for. Wifi is eye wateringly expensive. The official photos taken throughout the crossing are similarly expensive. Drinks all carry a 15% service charge. We didn’t try the $50pp alternative dining at the Verandah but heard it was excellent. The poker machines in the small casino are fun but greedy ! None of this should distract from the experience of travelling on the QM2 though, from the wonderful deck 7 wraparound old style wooden deck to the entertainment to the chance to meet a lot of interesting people and relax in a ship that copes smoothly with even rough waves, the QM2 is a great way to cross the Atlantic. What will it set you back ? Well, it isn’t a budget option. An inside accessible cabin on decks 4 or 5 will cost £1100 per person for a 7 night trip. Not exactly Easyjet of course and you can then add some extras into that or not, depending on your use of wifi, love of special photos and spa treatments. Overall for most this tends to be a special one off treat, often part of a holiday of a lifetime type experience. But it is more accessible than you might think in more ways than one, so well worth considering. 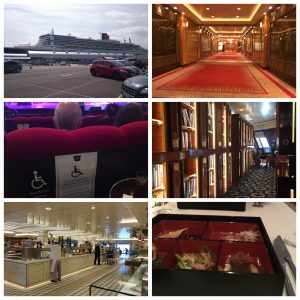 The QM2 is the last Liner to regularly ply the Atlantic, try it if you can and don’t be afraid to tackle the trip from a wheelchair or mobility scooter or as someone with a mobility impairment. Equally I think customers with sight or hearing impairments will find the ship welcoming if not exactly state of the art in terms of accessibility. This entry was posted in The Blue Badge Blog on 9th July 2017 by rustyman.